i live in CW Queensland and have been into archery for ~18 months now. mostly been chucking arrows at cardboard bale targets, but i've stitched up a couple hundred thousand hectares to go hunting on when i get some time. hopefully, i'll have some time to get stuck into the feral cat/dog/fox/pig/goat/bunny populations very soon. the rains earlier in the year have led to an explosion of feral populations, i counted 15 pigs on my way home from a job on Friday and i'm starting to see feral cats ~50km+ from the nearest town. toxic pests that they are. i have a 70lb Fred Bear Showdown which is my first bow. it's great to see the forums back up again, pity we lost so many great threads when the <expletive>'s hacked the old site. thanx to the Admins for all their work to get us back on the web. and a BIG thanks to everyone for all the wonderful advice and help i've received over the last 18 months, i'm sure i'll need a lot more help and advice yet. My name is Sean Walsh aka WARRA, I live in western N.S.W in a small mining town called Cobar I am a under ground shift supervisor in one of the mines and have been in the industry for 14yrs, Am married with two boys 2 and 12 with number three on the way, I have been hunting all my life and apart from my family can think of nothing better to do be doing in the bush. 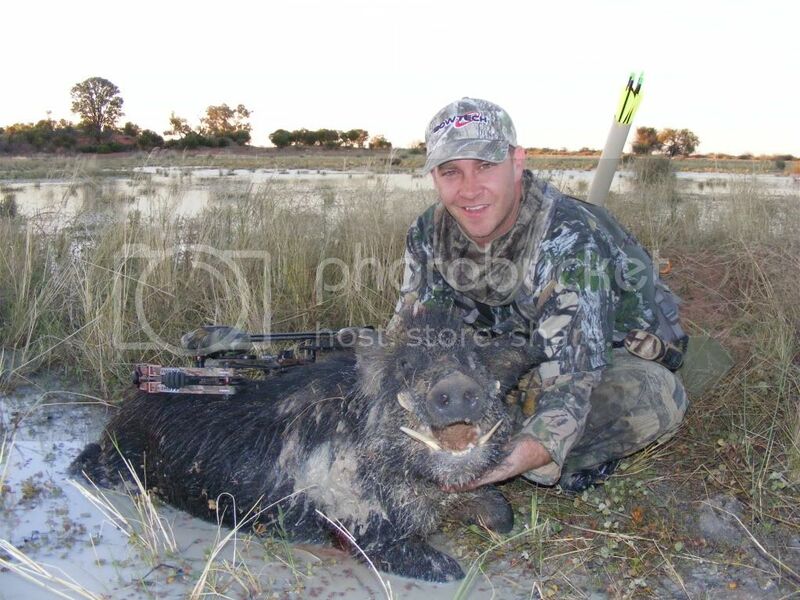 Hi guys my name is Elliot Woo I'm from Wagga Wagga NSW I have been bowhunting on and off now for about 2 years but over the last 6 months I have really spent all my spare time bowhunting and given up my other hobbies. I am becoming more addicted with every hunt. It is truly like a disease butI dont want a cure for it. Look forward to chatting to you guys and maybe catching up for a hunt in the future. Gday to all most of the old crew would know me been bowhunting for around 25 years now, together with my partner natalie we run Victorian Bowhunting Adventures mainly chasing sambar. Also run Victorian Sambar Bowstalkers.Would like to thank the admin team for getting us back up and running its good to be back and we look forward to reading all the wonderful post from the people involved in this great sport. my name is tom and im a alcoholic...........whoops wrong site ;) nah tomshaw from the old site. good to see you have the site back up and running. Hi, Steve's the name, go by Beleg (from the Tolkien books). Been doing archery for ages, hunting with the bow for about 4 or 5 years. Don't get to hunt much these days, hopefully get to do some more this year. Learned heaps from this web site, well the old one, glad it's up and running again. Hey guys, my name is Ryan. I live in the Adelaide Hills with my wife and 2y/o daughter. I'm a sparky by trade but have a background in IT. I have been into archery for almost 2 years. Joined Southern Field Archers about a year ago. Enjoy shooting 3D competitions and finding out everything I can about archery. Looking at getting into the more competitive side of the sport and trying my hand at target in addition to 3D, paper and bowhunting. I've been bowhunting once, saw plenty of deer over the weekend but a shot failed to present itself. So I'm still very much a virgin in this area. Very happy to be back and happy to contribute as much as I can to this new site. See you all around the traps. Robert Hunter is my name but mates call me Bert! I'm from South Oz and spend my spare time chasing Fallow and Reds. Great to see the site up and going again, shame to have lost so much valuable info and great stories. I look forward to seeing everyones input and being apart of this site as it grows.